An important part of the Center for Learning and Memory mission is training the next generation of neuroscientists to be pioneers in the field of learning and memory. CLM faculty engage this mission at many different levels of education and actively train undergraduate and graduate students as well as post doctoral fellows. Graduate: All CLM faculty train graduate students that have been accepted into the neuroscience graduate program. Click here for information about the neuroscience graduate program and how to apply. In addition, some CLM faculty train graduate students from other doctoral programs at The University of Austin that are applicable to the study of neuroscience such as psychology, physics, biomedical engineering and cell & molecular biology. Prospective students interested in these doctoral programs should refer to the appropriate department website for program information and make individual inquiries with the CLM faculty member of interest. Postdoctoral Fellows: CLM is a vibrant and collaborative environment with unrivaled opportunities for postdoctoral training. CLM faculty members consider outstanding candidates for postdoctoral positions on an individual basis. Interested candidates should contact the faculty member directly. Click here for the CLM faculty directory. Undergraduate: Many CLM labs offer undergraduate students the opportunity to gain research experience through research internships. Undergraduate research is taken very seriously, with faculty designing a project and format for the internship that best fits the student and lab interest. Therefore, arrangements for internships are made on a case-by-case basis. Undergraduates interested in an internship in the Johnston lab please click here for more information. For all other labs please contact the faculty member directly. Click here to go to the CLM faculty directory. 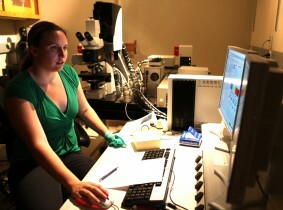 For information about the undergraduate neuroscience degree program at UT please click here.